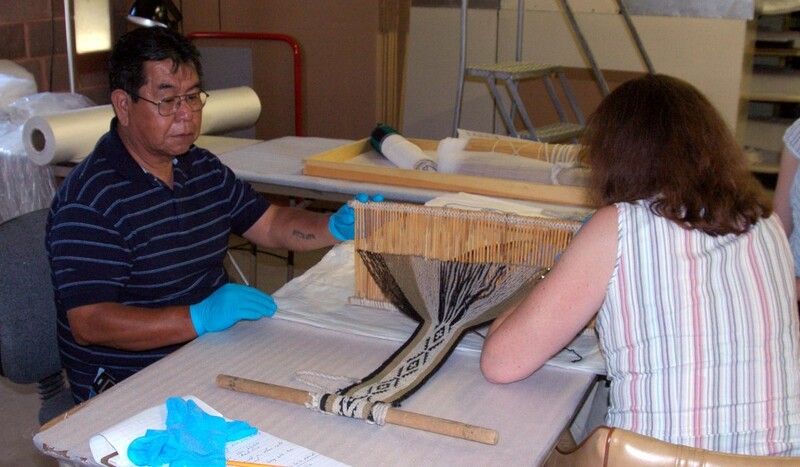 Austin Lomatewaima (Hopi Weaving Instructor) and Cara Varnell (Textile Conservator) creating storage mount. Ensuring that the objects in MNA’s collection are properly stored and cared for is the primary responsibility of the MNA Collections Department. In recent years, MNA has received a number of grants to enhance the care of its collections. For more information about MNA’s conservation and preservation efforts, click here. In the same way that MNA cares for its collections, caring for family heirlooms and works of art is important for preserving them for future generations. This page provides resources that will help you care for and appraise your objects. Caring for your Treasures and Finding a Conservator The American Institute for Conservation (AIC) on its web site has a section on its home page that is titled: Caring for your Treasures. You also can search AIC's database for a conservator in your area.